The day after Thanksgiving I had a chance to re-do an interview with Perry Pillar, a man whose parents and grandparents had lived in Rausch Creek. I first met him back in the summer but had some problems with the recording that I did. I’ll write more about the interview—and the tour he took me on following—in another post. As we drove around in Perry’s Ford pickup truck, he mentioned an old schoolhouse that was situated between Lincoln and Molleystown. Although the site is not really part of my study, I asked if he’d take me to see it. He turned on to a short road that was closed by a gate, turned around and parked the truck. Just to the north about 100 yards or so through some dense underbrush, we could barley make out the lines of a man-made structure. 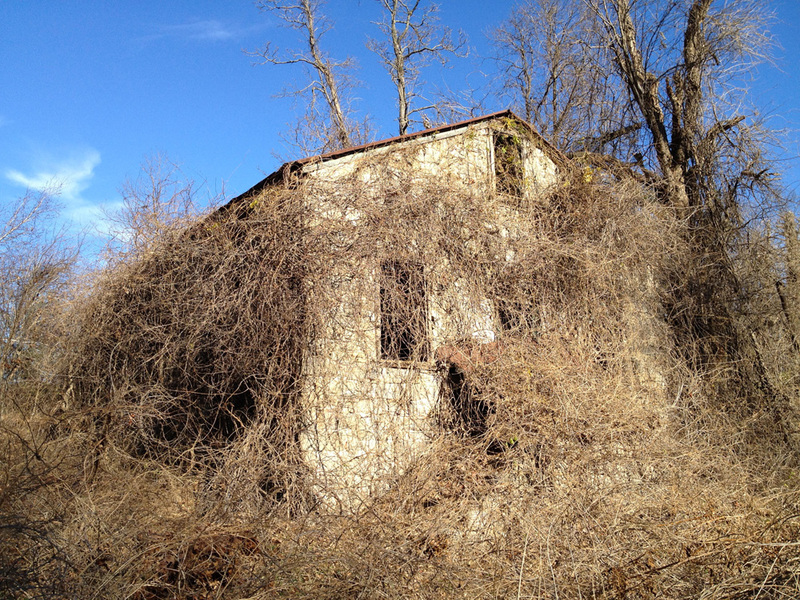 After hacking our way through the thicket, we walked inside what Perry described as an 1850’s schoolhouse that might possibly be one of the oldest such structures still standing in the county. The thick stone walls were covered by trees and vines, but we could easily access the side entry. A lack of windows and doors left the interior completely exposed to the elements, but the roof was largely intact and the floor joists solid enough to hold our weight. Four rooms had been created when the school became a private home and a stairway led up to an attic space. The inside was eerily colder than outside, a phenomenon no doubt caused by the cooler air of the underground crawlspace seeping up through the rotting floorboards. Perry showed me photos of the site from several years ago and noted that the roof over the front landing had collapsed and the brush surrounding the property had grown much thicker. It’s a shame that the structure will likely be gone in another few years. Perry was surprised the coal company that owned the land had not torn it down long ago; a now reclaimed strip mine lay just another 100 yards or so to the east. He also relayed that a railroad had once crossed just a few feet in front of the building (a fact my historical maps confirm). It was said that the train was so loud that lessons had to be suspended until all the cars had passed by the front door. Last fall, hoping to gain some insight into the process of how the state acquired land for the interstate highways, I read the book Right-Of-Way Man: Clearing the Path for our Nations Highways, by former PennDOT acquisition negotiator James Broadbent. (On a side note here, there truly is a magazine for everything!) While a fascinating account, the book did not really answer my questions about the process. So, this being the age of the Internet, I decided to look up the author and contact him via e-mail. Mr. Broadbent surprised me by calling my cell. Our brief conversation basically pointed me to the county courthouse, the final resting place for all records related to land transactions. The prospect of dealing with land records is not something I relish, but I do know someone who might be able to help me pilot me through those murky waters: great-uncle Robert Lehr, a surveyor who not only knows a thing or two about deeds, but grew up in Tremont Township and currently lives in Rausch Creek’s backyard. Of course, I had thought to talk to him earlier, but now I had even more reason. So, six months later (did I mention I’m a procrastinator? ), I finally make the call and get a few details (some fuzzy, some concrete) to fill in the picture and some leads for oral history. Best of all, I now know that he typically doesn’t go to bed until 11 p.m., so I can probably call him again without waiting for some precious, free daytime hours! Attendance at this year’s Mid-Atlantic American Studies conference and my inability to sleep after 5 a.m. this morning have conspired to bring me back to this blog after a lengthy hiatus. I have been on the fence about whether to actually proceed with this topic, partly because the really easy research that I’ve completed has not revealed much information. To proceed, I must dig deeper, which primarily means conducting oral history interviews. This has me a little nervous because I know it will be time-consuming, and I feel like I need to give more thought to the structure of my paper to be sure I’m asking the right questions. Laying in Delton’s bed this morning (he joined us in our bed so I retreated to his knowing that I would need to get up early for the rest of the conference), I began thinking about Rausch Creek in terms of successive loss: first of industry (gainful, local employment), then community (schools, businesses, families) and finally, physicality (razing of homes and infrastructure). Building on this framework may be difficult because I’m sure primary sources on what existed in the first place will be hard to come by. I also had the thought that I should perhaps expand my scope a bit and focus on all of Tremont Township, which today has a population of 200 (one source says there were 1000 in 1880). This will make discussion of statistics and schools easier, but may complicate how residents talk about community as a whole. No better cure for procrastination than to discover that one of your primary research sites will be closing for a four-month renovation in a week’s time. Thus, I found myself taking a day off from work last week to look over some documents at the Pennsylvania State Archives. The archives reading room is now closed until February, but I got a chance to at least pick the low-hanging fruit there. Much of the material at the State Archives is divided into several dozen record groups that correspond to various state agencies, boards, committees and governing bodies—old and new. RG-47 is a catch-all category that covers the archives’ holdings of county records. Here, I found some tax assessment books for Tremont Township from the late nineteenth century on microfilm. Unfortunately, the copies were hard to decipher and mostly irrelevant without a better understanding of who these people were or exactly where they lived. I might return to these if I do a more thorough examination of the census records. RG-47 also included two volumes of books listing alcohol licenses for Schuylkill County for the 1920’s. None were listed for Tremont Township, but I did notice that, each year, Shenandoah had five pages of listings—more than any other community. That explains a lot! Not until I got to 1923 did it dawn on me that this was the era of Prohibition and yet hundreds of licenses for bars, brewers, distilleries and distributors were being issued. Then, beginning in 1924, the number dropped to a tiny fraction. As best I can tell, these were mainly for distributors (like the ancestors of my wife’s Uncle Jimmy). What they were selling, I don’t know. It appears the recordkeepers sort of gave up later in the 20’s, probably wondering why they needed such massive volumes (these were easily 24″ x 36″) to record a page or two of license each year. The Archives also includes a lot of non-governmental records in several hundred manuscript groups—many of which are devoted to the papers of a particular individual, organization or business of significant historical value to the Commonwealth. The description for MG-415, the papers of Ivor D. Fenton, mentioned a folder on the Anthracite Expressway (an early name for Interstate 81). Dr. Fenton represented Schuylkill County in Congress from 1939-1963 and was, apparently, the primary supporter for this particular highway route at the federal level. I found several letters, speeches and a newspaper articles that make clear that many in the region considered this road a vital component for economic revitalization in the coal region. Another manuscript group that looked promising was MG-402, a collection of photographs taken by a UPI photographer, Phadrig Cahill (great name!). The folder listings mentioned many central Pennsylvania locations, including Joliett, a village that lies a mile northwest of Rausch Creek. I was hoping to find some images of the nearby landscape, but what I got was a photo of a mother holding a newborn surrounded by several siblings. This struck me as an odd subject for a major news organization, until I flipped to the next image which showed Mrs. Lucas (wish I could recall the first name!) surrounded by all 20 of her children. It was the Duggars of the 1950’s, right there in impoverished Schuylkill County. Wow, sure is dusty in here! While I may not have been up to a whole lot of doin’, I have been thinking a lot about my thesis. With the need for a written proposal looming large, I’ve been trying to wrap my brain around what exactly the shape of this thesis will be. I keep thinking about it in terms of a museum exhibit: I want to collect “objects” and arrange them to tell a story. That’s the mindset that has drawn me to American Studies, and public history in particular. But, storytelling is not enough, and I’m beginning to wonder if I will even have enough material to go that far. Tonight, I find myself at Penn State Harrisburg’s library looking to be inspired by leafing through some theses already on the shelves. Hopefully I’ll come across a topic as narrow as mine. Otherwise, I may have to abandon ship and find something more universal to write about. In the summer of 1999, I spent a couple of months interning at the State Archives in Harrisburg. I’ve managed to keep in touch with my supervisor there (thanks Facebook!) and told her about my research. She suggested I contact a co-worker’s husband, who happens to do historical preservation work for PennDOT. That gentleman, in turn, forwarded my e-mail to another State Archives employee, someone who remembered my brief tenure writing up descriptions for the state hospital records over a decade ago. He suggested I might have better luck looking at federal highway records at the National Archives. I had initially put aside looking here because, while our interstate system of highways was built with federal money, virtually all of that money was funneled to the state highway agencies that handled construction. That said, what I am looking to find here is some documentation about how the route of Interstate 81 was planned, something that probably began at the federal level. And, it turns out, there are boxes of records for the Harrisburg office of the federal highway administration in the National Archives building in Philadelphia. So, a trip to Philly is in my future, which is actually a good opportunity because it will be my first experience looking at federal records. Pottsville is literally falling to pieces, but the library looks about the same as when I left it. I don’t recall exactly when that was, but I know I’d been there a handful of times after its expansion in the late 90’s. I was quite disoriented, and the countless hours of my youth spent leafing through the index cards and wondering the shelves in the years before that renovation were of no use in this space. Eventually, I managed to find the microfilm readers and dug into the January and February 1967 reels of the Pottsville Republican. Although this was the time frame of the Reading Eagle article that prompted this whole quest, I found nothing pertaining to Rausch Creek. I did find a brief article on the Anthracite Expressway in a special “boosterism” section from the January 31 edition. Some unrelated finds: gender-specific help-wanted ads, news of a failed merger between the Schuylkill Haven and Blue Mountain school districts, an article on a UFO sighting over Branchdale and a Franklin & Marshall dean’s list mention for one Richard Wolfgang, the high school teacher who encouraged me to apply to his alma mater! After a break for lunch at the Garfield Diner (my first time there! decent cheesesteak, so-so service), I did also manage to make some photocopies of maps from an 1875 Schuylkill County atlas. Lancaster has a similar style atlas from the same time period, and I wonder if they were done by the same publisher. I then planned to make some copies of 1930 census records, but I began to question I shouldn’t just invest in a subscription to Footnote or access the names and data in some other digital fashion. So, for now, no copies made. Unless I get more specific dates to search in the Republican, I don’t think I’ll need to come back here. Next stops in the county: Penn State’s library and the county historical society. Stopped at Mootz Candies on the way home and picked up their dark chocolate version of a club sandwich. Picked up one for the kids to split, but they preferred to have M&M’s and Smarties for dessert. Skooks they are not.